Large capacity, a compact size, an integral powered spindle, and simple, intuitive software make the CarveWright an excellent introduction to CNC. A CNC with both large capacity and a small footprint seems like an impossible dream, but the CarveWright CX makes that dream come true. Thanks to the CarveWright's unique conveyor belt system, the machine can accept workpieces up to 12 feet long, despite having a footprint the size of an ordinary planer. Instead of requiring a space-hogging bed and gantry to accommodate large workpieces, the CarveWright features a precision conveyor that moves the workpiece itself past the cutting spindle along the long axis. Unlike many CNCs, the spindle is also built into the machine, meaning you don't have to purchase a separate router. With the included easy-to-use drag-and-drop software, plus the automated setup features built into the CarveWright CX, you can easily create stunning carving projects in very little time. Optional add-on apps can enhance your capabilities, while the CarveWright Pattern Depot gives you access to over 7,000 patterns and projects to download. Just point, click and create. 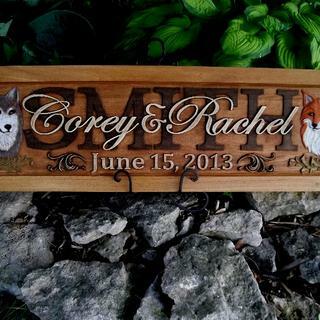 We run an online business specializing in Custom carved Anniversary / Wedding Plaques. 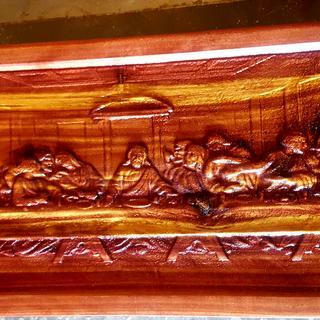 We use the CarveWright System exclusively with excellent results. Would recommend this machine for anyone interested in learning CNC design and routing. The software is very user friendly and expandable as you go. I'm up to 4 CarveWright machines now. My retirement hobby has turned into a full time job just about. This misses and I do the craft shows and we just simply wouldn't be doing it without CarveWright. I maintain my machines and i service them when they need it, but it's nothing I wouldn't expect from a piece of machinery. I've had nothing but great service from the company and I sure needed the help in the beginning. I will definitely purchase again. This machine is great for woodworkers of all skill levels. It does require some maintenance as all machines do. If you take the time to learn the software and do the maintenance it is fantastic for a number of jobs. Sure this neophyte had a steep learning curve, but then a complex tool coupled with multi-option and design software was not expected to be a walk in the park. Entry level costs were ok, but the need for additional software became evident quickly, which boosted the costs for doing fine work other than just routine carve a name with border designs. There are so many options and methodologies that make it challenging and fun to work with. I’ve found support to be quite good and responsive. The one major issue I have had is the software locking up without warning and losing, in several cases, rather intricate layered work. Now, I save sequential editions just about every time I get a part done. Then delete the previous ones at the end of the design phase. Loading the board sequence at the start has some quirks but once it starts carving, just stand back and wait for the pauses for changing out the programmed bits. Oh yes...check on production values...there are several akin to draft, good, better and best for the degree of fine work. To sum up my experience so far - a fun entry-level priced addition to my workshop that I see lots of potential projects for in the future while committing to maintain it appropriately. I have e Carvewrites An A and a CX. I almost sent the A back to be rebuilt and decided to buy a CX from Rockler.The A was perchased in 2000 and my computer skills and the machine were all challenged compared to what these are today. The machines are cheeper and with all the upgrades are actually the best value that they have ever been. UTube is a great asset to get these up and rolling.Ask bud on the software and machine fundamentals, and learn the forum and how to search in it and you should be able to achieve a fair amount of success. I am a 40 year plus Professional Woodworker so I can prep almost ideal blanks. I have a 16 inch jointer and 20 in planer. I can flatten and surface parallel, that helps that brass roller with the o ring work better.I am going to try to get the A machine going, It had an error that I just could not figure out at the time. The concept of this machine is great... small footprint but large capacity, and affordable compared to other CNCs. I've owned mine for about 6 months now and am quite disappointed. It's extremely finicky in that during the self-checks/board measuring process prior to carving it almost always seems to fail. I write detailed messages to Carvewright support and get one-sentence replies, if any reply at all. Only after piecing together four of five of these messages do the answers actually add up to something useful. This has happened multiple times. Knowing what I know now, I would not purchase this machine. I bought my Carvewright machine a little over a year ago and have used it fo a little over 60 hours. I followed all of the maintenance directions that came with the machine. I began having problems with it at around 58 hrs. I continually get axis stalls, bad data cards, and now it screws up every time I try to use it. The support people stand by the machine and blame whatever is wrong on me, I'm sick and tired of Carvewright and I am basically out about $2600 for the machine, bits, and accessories. I really like the design concept but I want to be a woodworker, not a maintenance guru for this machine. It is no longer working! I think it’s a bad machine! Great machine, when it works. I've owned this machine for a year, using it exclusively for sign-making. The big plus is the software. It is easy to learn and use, and you can soon learn what the machine can and cannot do. The machine itself does a wonderful job - when it works. Mine has been down more than up. Less than a month after it arrived, the crank mechanism failed. Support couldn't seem to understand what I needed to replace - and by the way, it was not covered under the warranty. Next the head cover cracked and that wasn't covered either. Then the spindle end went bad and it wasn't covered either and took a month to get a replacement. Now the head cover broke again, after barely 16 hours of use and they don't know when they will get one. I just have to keep calling to see when they get one. For some reason, they can't order a part, they just have to take what they get???? The board sensors are very inconsistent, despite constant cleaning. The machine has some definite weak points, but they have no plans to change anything in a new model. The warranty doesn't seem to cover much of anything. I bought a package deal from Rockler, which included a 1-year protection plan, and now they say even though it showed on the order that it wasn't included in the price, even though the amount was added to the price of the equipment. I would have been better off to apply the same money toward a more durable and accurate CNC. This machine may work well for you, as it has for others, but was a mistaken purchase for me. Terrible support and bad construction of important components. Then finially hardware issues lead it to being a 2500$ door stop.. Compared many brands & models and for the price this had the easiest use, best features and largest capacity plus my strong belief that if Rockler sells it, it's good! Seemed a good value for the features. I like the 12 foot workpiece capacity. Highly recommended by a long time user and the ability to handle longer wood planks. 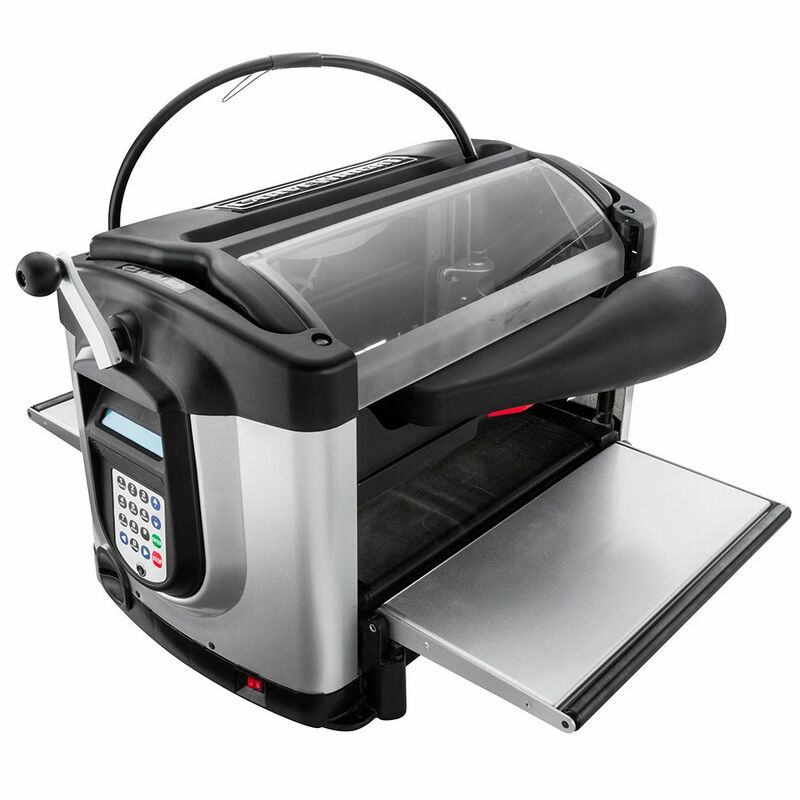 What all can be done with just the basic machine without having to add any assesories? BEST ANSWER: The basic machine and software is very versatile, and you can do a wide variety of projects with it. If you look on the Carvewright site in the Pattern Depot look for projects - not patterns - for projects that can be done with Basic Designer software. This will give you an idea. Many projects require only the 1/16" carving bit and the 1/18" cutting bit, basic machine, and Basic Designer software. I myself have designed and built wood gear clocks using only these bits and basic machine and software, which you can find in the Pattern Depot. I highly recommend a dust hood however. 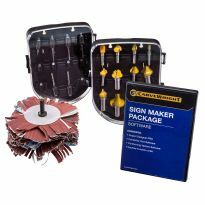 Rockler has one available, there is one on the Carvewright site, or you can make your own. Fine dust is the enemy; a top-mounted dust collection hood will prevent many issues. BEST ANSWER: I Have 2 CW Machines 1 is 8 years old over 400 hrs and I have had to put in 1 part at $14.00. 1 is 6years old about 300 hrs and have put in about $200.00 in parts. I love them. My experience is that this machine is down more than it is working and getting repair parts in a timely manner is iffy. I'm not recommending any other machine, but my advice is take the money and apply it toward a machine that is built to last by a manufacturer that can prove it. This was the most unreliable machine i have ever purchased. Customer support was rude and unhelpful. Is this another comment from the guy who owned 3 Sears machines 10 years ago? I want to duplicate a cabinet door. It is 14" x 18", oak. It has a Roman Ogee pattern routed inside the frame and a flat panel in the center. The Roman Ogee is custom and I can't find a router bit to make it. Can the CarveWright copy my door? BEST ANSWER: It can, but you would need the Scanning Probe accessory and accompanying Pattern Editor software to do this. Also, keep in mind that the standard carving bit has a 1/16" radius tip, so it cannot cut sharp corners, in case your Ogee has them. To set up such a project properly would require some experience with the machine, software, and Scanning Probe. I wouldn't recommend it as a first project without getting some experienced help. Can a carvewright engrave metal? BEST ANSWER: Not really. It's meant more for wood, hard plastics, foams, and machinable waxes. I've heard of people trying it on the forums, but have never seen any results. The machine is very enclosed and the electronics aren't really shielded for metal shavings, so I suspect it could cut some metals, but it would most likely cause damage to the machine. Is it possible to split up ,in the software, to create a wider project than 14" . Then by gluing up matching segmented consecutive boards to create a seemless looking project? BEST ANSWER: Yes this can be done, I have done it many times. No add-on software is required - it can be done with the Basic software. I don't know yet. Just got it and still learning. But I would imagine you can do this. Yes it can split up any of your jobs it is a add on software. Is this a good machine for doing signs such as quarter board signs? BEST ANSWER: The CarveWright would be perfect for carving quarter board signs. The software makes it easy to design with any font on your computer and with different carving styles to choose from. They have a demo version of their software on their site to download and play with if you want to see how easy it is. Thank you so much Jim. Appreciate your reply. I have done a lot of State Quarter boards with the CarveWright. There is a free project design on the CarveWright users forum that I used and modified for my needs. Can the rotary jig be purchased separately? I want to purchase the accessory pack that does not include. 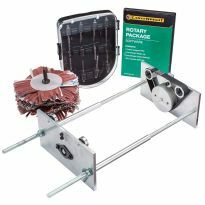 BEST ANSWER: Yes, the rotary jig is also sold separate from the package deals. 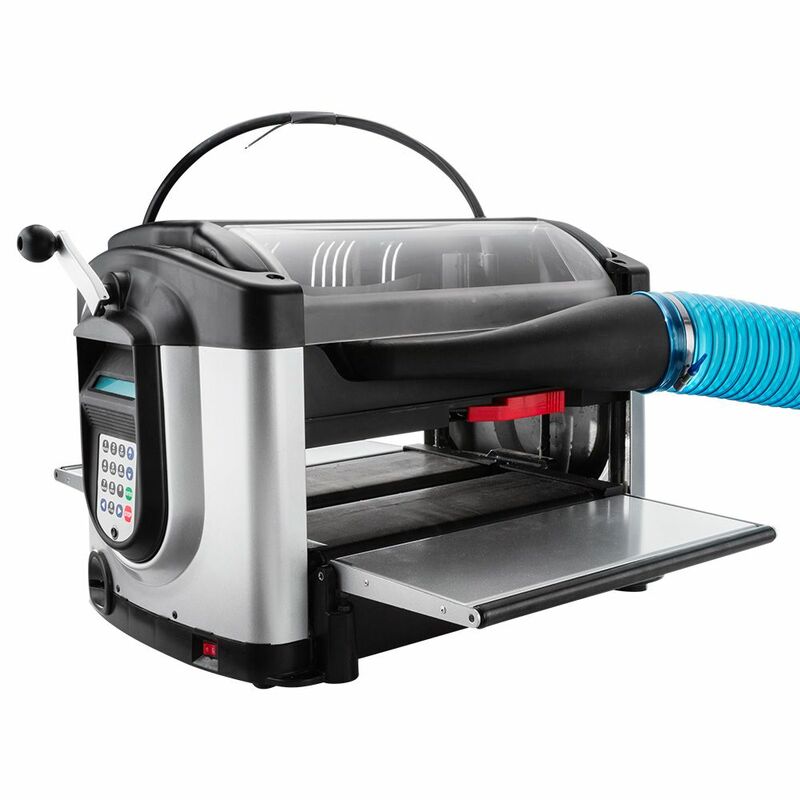 What dust collection is available or should be used with CarveWright? BEST ANSWER: Check out the CarveWright web site for the available dust collection options. They are listed under the 3rd party vendor section. There are also a few make your own projects for dust collection attachments on the CarveWright users forum. can this machine do inlays + both parts ? BEST ANSWER: Yes, It can do inlay work in several ways. The wedge cut inlay is the most practical process, where you cut the pieces with matching sloped sides to the 2 pieces get wedged together, then planed and sanded for a perfect seam. There is a lot of filler inlay work being done as well, where an epoxy like product is used to fill in v-cuts for some pretty spectacular finishes. They can make that stuff look like anything. The cx machine does it have the rubber belts that pulls the piece of wood through the machine? BEST ANSWER: Not belts exactly but a rubber covered try on the bottom and a rubber covered roller on the top. It works really well. Yes, and the work just fine. I made some plaques using the machine and am happy with the product. Mine did come with the rubber conveyer belts. Has anyone tried to copy a picture with this machine if so how did it turn out? My wife is sold on it when she saw that the video said you could copy pictures on the carvewright. BEST ANSWER: Doing the pictures on plastic is amazing and easy. Lithopanes they're called. Carve a frame for it, put a back light on the picture, and I can't keep them on the shelf they sell so fast. Can a laser be attached to this model? BEST ANSWER: Currently there is no laser module available for the CarveWright CX. I make segmented bowls and lamps. I have to chop saw thousands of pieces out of hardwoods, some very hard woods. Can this machine do the job and cut out large amounts of small segments? BEST ANSWER: What are the shapes of these pieces? My guess is yes, it could do that, but I'm not sure it would be the best suited tool for that job. It's the chop saw part that makes me question it. Chop saws cut really fast compared to any CNC machine. I would need to know more about what these pieces look like. The shape is trapazoid.My concern is not so much the speed, but the endurance of the machine to be a "work horse". And also that they are completely separated from board. It could definitely cut the parts, but if I were going to cut thousands of them, I'd buy 2 machines. Can this machine carve recycled planks? Also can it be used to drill thru holes at programmed locations? BEST ANSWER: Recycled, meaning those plastic type boards they make decks out of, or more like reclaimed wood such as barnwood or an old cedar fence? Either way, the answer is yes. 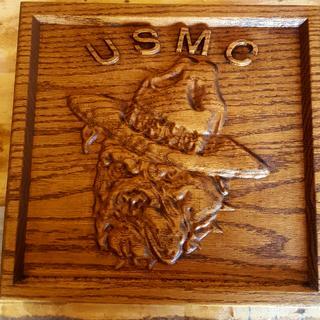 There was a pretty neat article recently on the CarveWright BuildBlog about carving on reclaimed wood. I can also drill holes at programmed locations. The forums are full of cribbage board projects where it's mostly a bunch of drill holes. Thanks! I'm talking about the recycled plastic planks used for either decks or picnic tables. What is widest length that can be routed? BEST ANSWER: The machine can handle a workpiece up to 14.5 inches wide x 5.0 inches thick x 12 feet long. 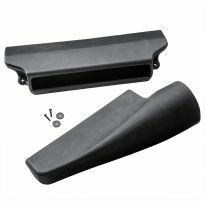 The maximum length in most cases is dependent on the weight of the material being carved. A workpiece weighing more than 20 lbs in weight places increased stress on the drive mechanism and will accelerate wear on the system. Stand-alone support rollers should be used when machining long (over 3 feet) workpieces. Where can I order the card and card reader? 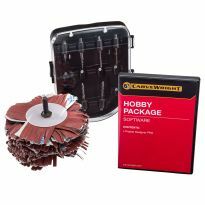 Cards, card reader, bits, patterns, and software can be found at Careveright’s store site. I'm seeing a lot of reviews where they complain that the sawdust is what is causing their failures. Does adding the dust hood stop a lot of the reported issues with this machine? BEST ANSWER: I have dust collection (1250 CFM) and notice great improvement in bit tracking especially when using a cutting bit to cut out patterns. Highly recommended!! The saw dust hood helps, but you still néed to clean and blow out the machine after each use. can you use router bits? BEST ANSWER: Yes you can but you have to have a split and stop collar for them. 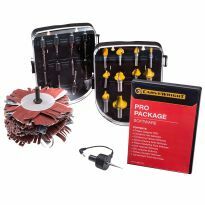 Check out Rockler's website and see if they carry them and for sure, Carvewright carries them. Yes, I've used several of my own, and seems to work just fine. The software allows you to take more passes and smaller bites. Can this cut a puzzle? BEST ANSWER: There are three parts to a puzzle design: the substrate, the picture and the cutting pattern. A CarveWright can follow a cutting pattern after you import or create the shapes. I think you would have to get the picture printed and then adhered to the wood. Cutting thin materials requires a jig to carry the material. You can learn from the website. I think it would take a long time to do if the puzzle is large. Can this machine cut individual pieces.....like puzzle pieces or one long cursive word? I want it to cut through the wood not just engrave. Thanks! BEST ANSWER: Yes, it can cut separate pieces, although you have to leave a small tab to connect the pieces and then cut the tab to separate your parts. Otherwise the parts would move around when you carve through the last edge. Awesome! Thanks Malinda for the quick reply! can the initial materials with this purchase to true baroque designs? Without buying any extra bits or accessories? where can you get a book on how to use this? BEST ANSWER: It has rubber belts. Are there any plans to add a laser module option in the near future? Is this a good one for a beginner with no experience? BEST ANSWER: The software is very easy to use. But the machine is very unreliable. 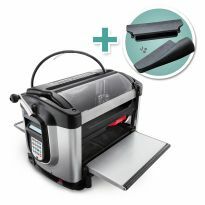 Does this machine carve chip board as used in scrap booking projects? BEST ANSWER: Yes, It can cut chipboard no problem. It will need to be mounted on a backer board for the machine track it properly. 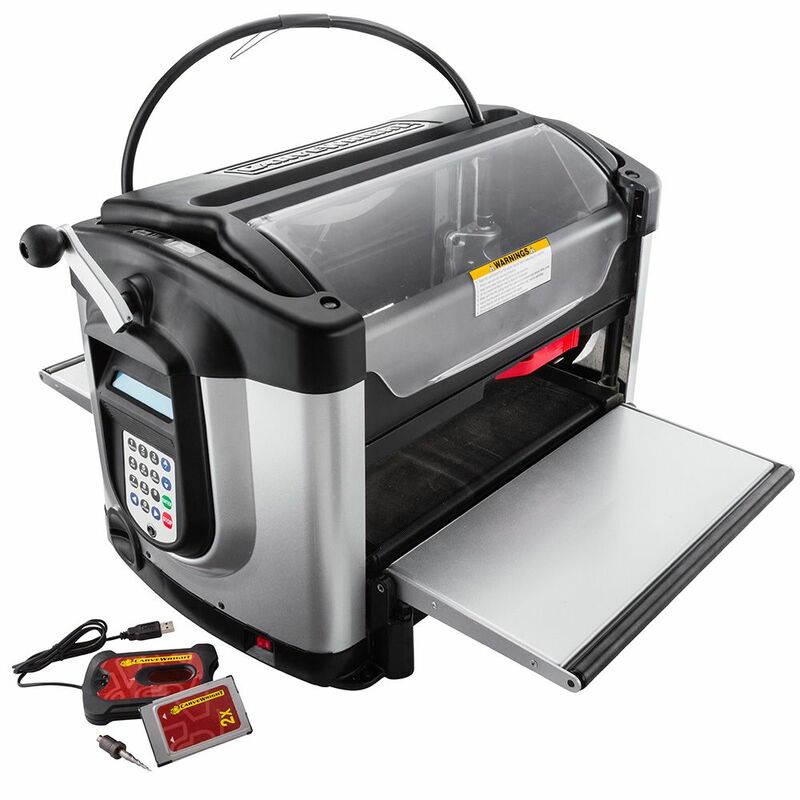 Since this like a planner does this cnc router have some type of snipe when using long board? BEST ANSWER: The longest board I've used so far is 24 inches and the carving area is only 16 inches. I haven't used it to route or act like a planer, so sorry, I can't answer this question for you. how does the carvewright work with acrylic sheets. i would think 1/4 inch max. and usually an "o" flute bit? dont think carvewight has these types of bits. anyone tried to engrave for led edge-lit signs? cast or extruded? dont see any videos on this. Can you download pictures off my laptop? Such as portrait photos? Will this do a full cut out of something, say a Texas shape out of a square piece of wood? Or is it just for engraving/carving? I’m needing this for my small business and was also wondering about sponsorship. Thanks!